Let the Finnegan bedding ensemble sweep you away on a journey through nature. The navy, rust, ivory, and yellow of this pattern will bring natural beauty to your room. A detailed print and beautiful accents bring a touch of luxury. The ruffled bedskirt adds another layer of dimension to this collection. 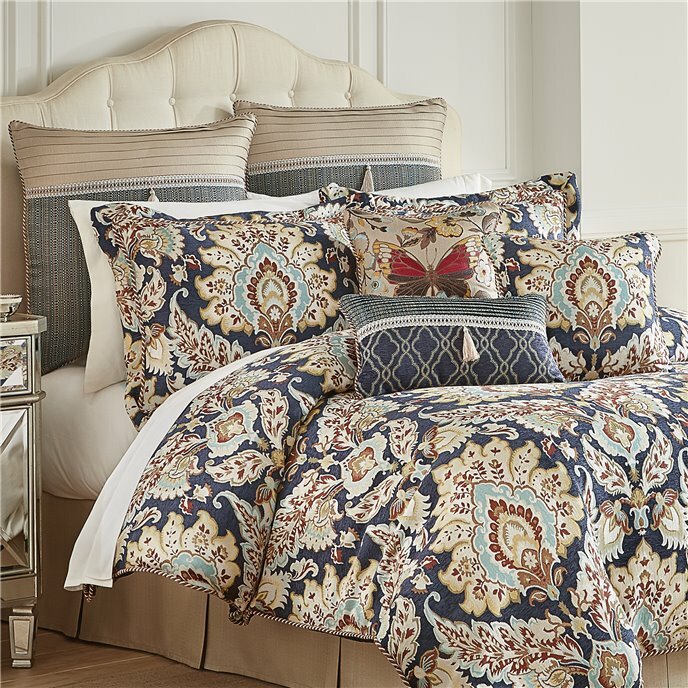 The jacquard drapery panels tie in perfectly to the print of the comforter and accent pillows. The accent pillows feature fun details like an embroidered butterfly and tassels, bringing a touch of trend to a classic pattern. Croscill has been a manufacturer of high quality bedding at affordable prices for over 50 years! The Finnegan Bedding Collections features an eye-catching, rich color story of natural life in a multi-colored damask jacquard against a chenille ground. The color palette featured in this collection is a stunning combination of various shades of blue, rust, ivory and yellow. The neutral colored Bedskirt is ruffled for added dimension. One (1) Queen Comforter, two (2) Standard Shams, one (1) Bedskirt 15in drop, Comforter measures 92x96, polyester fabric and poly fiber fill, dry clean recommended, imported. Manufactured by Croscill. The Finnegan Bedding Collections features an eye-catching, rich color story of natural life in a multi-colored damask jacquard against a chenille ground. The color palette featured in this collection is a stunning combination of various shades of blue, rust, ivory and yellow. The neutral colored Bedskirt is ruffled for added dimension. One (1) Cal King Comforter, two (2) Standard Shams, one (1) Bedskirt 15in drop, Comforter measures 110x96, polyester fabric and poly fiber fill, dry clean recommended, imported. Manufactured by Croscill. The Finnegan Bedding Collections features an eye-catching, rich color story of natural life in a multi-colored damask jacquard against a chenille ground. The color palette featured in this collection is a stunning combination of various shades of blue, rust, ivory and yellow. The neutral colored Bedskirt is ruffled for added dimension. One (1) King Comforter, two (2) Standard Shams, one (1) Bedskirt 15in drop, Comforter measures 110x96, polyester fabric and poly fiber fill, dry clean recommended, imported. Manufactured by Croscill. The Finnegan Euro Sham features a novelty texture pieced together with a neutral colored woven texture and finished with a delicate gimp and tassel. The sham reverses to the novelty texture and is trimmed with an elegant twist cord. One (1) European Sham, Measures 26x26, polyester fabric, spot clean recommended, imported. Manufactured by Croscill. The Finnegan 20” x 12” Boudoir Pillow features a combination of the novelty texture with a chenille trellis pieced together with a delicate gimp and tassel. The pillow reverses to the novelty texture and is trimmed with a delicate twist cord. One (1) Boudair Pillow, Measures 20x12, polyester fabric and poly fiber fill, spot clean recommended, imported. Manufactured by Croscill. The Finnegan 16”x16” Fashion Pillow features a stunning butterfly and floral pattern embroidered on the face of the pillow. The pillow reverses to a solid woven texture and is trimmed with a delicate twist cord. One (1) Fashion Pillow, Measures 16x16, polyester fabric and poly fiber fill, spot clean recommended, imported. Manufactured by Croscill. The Finnegan 18”x18” Square Pillow features a multi-colored jacquard against a chenille ground. The pillow reverses to the solid woven texture and is trimmed with a twist cord. One (1) Square Pillow, Measures 18x18, polyester fabric and poly fiber fill, spot clean recommended, imported. Manufactured by Croscill. The Finnegan Canopy Valance features the eye catching multi-colored damask jacquard against the chenille ground and is trimmed with the woven texture and tassel. One (1) Valance, Measures 54x19, polyester fabric, spot clean recommended, imported. Manufactured by Croscill. The Finnegan Curtain Panel Pair features a chenille trellis with matching tiebacks. Each panel is lined with a solid white polyester lining and include encased weights in the bottom hem. Two (2) Window Panels, two (2) Tiebacks, Measures 82Wx84L, polyester fabric, dry clean recommended, imported. (Second images shown with valance sold separately.) Manufactured by Croscill. The Finnegan Curtain Panel Pair features a chenille trellis with matching tiebacks. Each panel is lined with a solid white polyester lining and include encased weights in the bottom hem. Two (2) Window Panels, two (2) Tiebacks, Measures 82Wx95L, polyester fabric, dry clean recommended, imported. (Second images shown with valance sold separately.) Manufactured by Croscill.